Here we recognize staff and members who have achieved greatness in healthy living. It is admirable to make changes at any point in your life, no matter the circumstances, and we salute them! 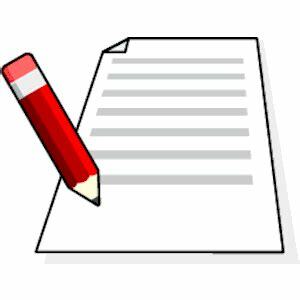 If you have information on a members’ accomplishment, please send it to barb_ymca@hotmail.com so that we can recognize them. There were nineteen teams in all from Atlantic Canada. Mary Beth Brown finalled in all of her events, medalling with a Bronze in the Senior Women’s 100 Free, with a 5th in the 50 Breast, and 10 Fly, 6 in the 200 Free and 2nd in the B final of the 50 Free. Alec d’Entremont placed 5th in the 50, 100 and 200 Breast for 14 and 15 year old males and 2nd in the Senior Men’s B Final of the 200IM as well as 6th in the B Final of the 50 Fly. Ibaad Hemani won the 50 Free for 13 and under males, and was 4th in the 200IM, 200 Breast, 100 Breast, and 50 Breast. He was 8th in the 20 Free. Congratulations to our very own Jennifer Hood, Aquatics Director. Jennifer was honored with the Sport Volunteer Award for all of her hard work with swimming. Jenn regularly attends swim meets, transports swimmers, and so much more. Thank you Jennifer for making health and wellness a priority and promoting our swimming community! The first provincial long course swim meet (50 meter pool) was held at Dalplex this past week end. There were two meets, a junior meet and a senior meet. No team scores were kept. Ibaad Hemani placed 2nd in the 200 Breast, 3rd in the 50 Fly, 5th in the 50 Free and 8th in the 200 Free. Chloe Durling placed 3rd in the 50 Breast and 50 Free, and 7th in the 200 Breast and 200IM. Bria MacKinnon placed 6th in the 50 Breast. Alec d’Entremont placed 2nd in the 200 Free, 3rd in the 50 Breast, and 4th in the 100 Breast and 200 IM. Parker Deveau placed 3rd in the 50 Fly, 6th in the 100 Free, and 7th in the 100 Breast. Jadyn Hood placed 8th in the 50 Breast. Ian Bullerwell placed 2nd in the 400 Free and 4th in the 50 Breast and 8th in the 200 Breast. Three Yarmouth Y Whitecaps joined 47 other swimmers on the Nova Scotia team headed to Bath Maine this week end to compete in the Maine Jr. Olympic Qualifier. All three placed well in their events earning points for Team Nova Scotia while also earning personal best times. In the 12 and under Girls division Chloe Durling was 1st in the 50 Breast and the 200IM, 2nd in the 100 Breast, 3rd in the 100 Free and 5th in the 200 Breast. In the 13-14 Boys Division, Alec d’Entremont was 1st in the 200 Free, 2nd in the 100 Free, 3rd in the 200 Breast, 4th in the 100 Breast and the 200IM and 7th in the 50 Free. In the 13-14 Girls Division, Hannah Maillet was 2nd in the 100 Fly, 4th in the 200 IM, and 7th in the 200 Free . The Yarmouth Swimmers had outstanding performances. Yarmouth Whitecaps participated in the Nova Scotia Swimming Championships at Dalplex in Halifax this past week end with 21 other teams from Atlantic Canada and Ontario. Yarmouth’s Mary Beth Brown placed 4th in the Sr. Women’s 100 Free, just missing a medal with a personal best time. She also placed 1st in the B final of the 50 Breast and 50 Fly, 6th in the B Final of the of the 400 Free and 8th in the B Finals of the100 Fly and the 50 Free. Ian Bullerwell placed first in the B Finals of the 50 Breast, 100 Breast and 200 Breast, and 2nd in the B Final of the 50 Back. He also placed 3rd in the B Final of the 50 Free. Alec d’Entremont was 8th in the 13-14 Boys 200 Breast. This meet concludes the short course season for the White Caps. The next meet will be a long course meet in April. Rachelle’s introduction to the sport of bodybuilding happened during the summer after her first year of University (2007). I started casually going to the local gym in her hometown of West Pubnico where she would see Suzanne (local girl) training for her first figure show. Intrigued, inspired and a bit intimidated, she immediately knew it was something she wanted to eventually pursue. She started training seriously in March 2015 following a back operation in January 2014 for a herniated disk. Her back was healing nicely and she was antsy to get in shape and lose some weight. At that time she hired a diet coach to get her meal plan on track and a friend helped her with her weight training program. One thing lead to another, she started seeing results and decided in July 2015 to compete in her first show in Montreal in October 2015. She placed 1st in her height class and took home the overall title. She continued training and competed in the ECCs in Halifax in December 2015 where she placed first in her height class. Next stop, 2016 Provinicals in March 2016. Jenn has been working out with weights for close to 15 years. She decided to compete after watching a friend train in 2014, and since that time, it was on her bucket list. The more she looked into the sport, the more she knew she had to do it. To compete meant dedication, so she hired a trainer and spent five to six days a week in the gym for a total of 16 weeks. Her workouts would be anywhere from 2 to 2 1/2 hours a day, towards the end of the preparation. Preparation for an event like this not only consists of gym time, but lots of travelling to Halifax for posing practice, and hours of meal prep. Jenn placed 5th in Bikini Masters at this fall’s ECC’s and plans are underway for the spring. Jenn continues to live a healthy lifestyle, and plans on competing at the Provincials in March 2016. Staff Member Samantha Comeau places at ECC’s! Why she decided to do it: She’s always had a passion for fitness. She always told herself she’d compete once she slowed down, once she graduated and settled. The truth is, there is no “better time”. she said. “I’ve had many comments from the gym crew at the Y encouraging me to compete, so I went for it. When you have a passion, you go for it. I started reading books, following people who have competed and asking questions around. I needed to know what I was getting myself into. I thought I knew it all, I wasn’t even close”. Sam put a lot of hard work into it: She’s a dedicated gym girl. 6 out of 7 days she was here working out. She started “prepping” 12 weeks before the competition. She hired a coach, bought her suit, heels, etc. On top of her training, She is a full time student, worked full time for a school work term and volunteered at the YMCA every Tuesday night. As it got closer to the competition, she trained before and after work and managed to fit in a hour at night for school work. She also spent a few weekends in Halifax for training, seminars and posing practice. Samantha has many aspirations for the future. Fitness wise, she hopes to grow, continue competition and maintain strong, healthy and happy. Congratulations to Samantha on a job well done. We wish you much success in the future! Ian Bullerwell placed 5th in the 100 Breast and 6th in both the 50 Breast and 100 Free. Mary Beth Brown placed 3rd in the 100 Free, 5th in the 50 Breast and 400 IM and 7th in the 50 Fly. Tasha d’Entremont placed 4th in the 12 and under girls 50 Free and 7th in the 50 Breast. Chloe Durling placed 4th in the 200 Breast. Hannah Maillet placed 2nd in the 200 Free, 4th in the 50 Free and 7th in the 400 IM. Also notable was Alec d’entremonts’ 2nd place in the 13 and Under 50 Breast, 3rd in the 50 Free and 50 Back. And Jadyn Hood Bent placed 1st in the 13-14 Girls 50 Breast. The athletes also competed with team mates in a Relay Meet on Saturday to launch the new swimming season. 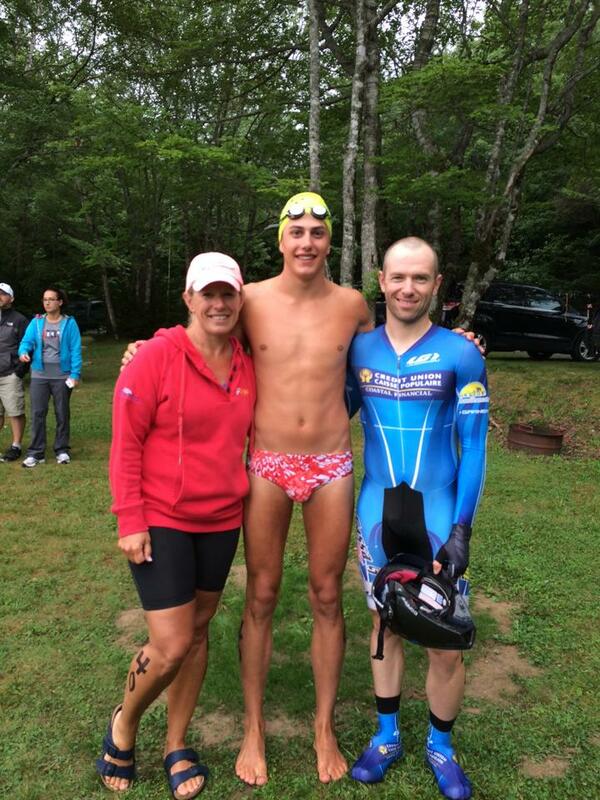 Yarmouth Triathlon 2015: YMCA Team Scores Big! Four Yarmouth Whitecaps: Alec Boudreau, Ian Bullerwell, Mary Beth Brown and Hannah Doucette completed their swim season in New Brunswick this past week end at the East Coast Long Course Championships. They were joined by their university swim mates Charli LeBlanc and Zoee LeBlanc. The girls placed in three relays, 8th in the 4 X 200 Free, 9th in the 4 X 100 Free, 11th in the 4 X 100 Medley Relay. Charli LeBlanc was 3rd in the Sr 50 Back and 12th in the B Final of the 100 Fly. Mary Beth Brown was 6th in the B final of the Sr 100 Free. In the male category, Alec Boudreau placed 5th in both the 12 and under 50 Breast and 200 Breast. Ian Bullerwell placed 6th in the B Final of the 200 Breast. There were 35 teams from Maine, Ontario, and all of the Atlantic Provinces. Six Yarmouth Y Whitecaps attended the Ken Dunn Long Course Swimming Championships at Dalplex in Halifax this week end. The Sr. Men’s relay consisting of Alec d’Entremont, Ian Bullerwell, Josh Bower and Dylan Bower, were 5th in the 4 by 100 Free Relay and 5th in the 4 by 100 Medley Relay. The same swimmers were 1st in the 4 X 50 Free Relay. Also placing in Sr Men’s events were Josh Bower 8th in the Sr Men’s 50 Breast and Ian Bullerwell 7th in the Sr. Men’s 100 Breast. In the 12 and Under boys events, Alec d’Entremont was 2nd in the 12 and under boys 200 Breast, 3rd in the 50 Breast, 4th in the 200 Free, 7th in the 200 IM and 8th in the 50 Free. In the Sr. Women’s category Mary Beth Brown was 5th in the 400 Free and 7th in the 50 Free. Our last meet of the season will be the East Coast Championships in St. John New Brunswick, July 1st- 5th. Tasha d’Entremont-5th in the 50 Free, and 6th in the 200 Breast, 50 Back and 50 Fly. Jadyn Hood-Bent-5th in the 50 Fly and 6th in the 200 Back. Hannah Maillet-4th in the 400 Free and 5th in the 100 Free. Shannon Nickerson alternate in the 100 Fly. Jenna Clayton alternate in the 100 Back. The 13-14 girls relays comprised of Natasha d’Entremont, Sylvia Thibault, Hannah Maillet and Jaydyn Hood Bent were 4th in both the 4 X 50 100 Free Relay, and 4 X 50 Free Relay . The team of Jenna Clayton, Shannon Nickerson, Jadyn Hood Bent and Hannah Maillet placed 4th in the 4 X 50 Medley Relay. This was their final meet of the year. Yarmouth’s Bobby-Lou Reardon, running her second consecutive Boston Marathon finished with a time of three hours, 48 minutes and 25 seconds. Denise Robson, formerly of Yarmouth had a great showing, placing third overall in her age group of female 45-49 with a time of two hours, 54 minutes and 11 seconds. Ontario resident Kimberly Cox also used to live in Yarmouth. Cox registered a time of three hours, 31 minutes and 53 seconds. Over 100 Nova Scotians took part this year. Seven Whitecaps headed to the East Coast Championships with coach Ginny held over the past four days in Mount Pear Newfoundland in their newSummit Centre. All seven athletes contributed to team points All senior swimmers were awarded points 1st through 16th. Others were awarded points for 1st through 8th. 12 and Under Boys: Alec d’entremont-Fourth in the 200 Breast, 50 Breast and 5th in the 200 IM. Senior Boys-15 and Over: Dylan Bower 9th in the 50 Free and 15th in the 50 Back.. Josh Bower 12th in the 50 Free, 14th in the 50 Fly and 50 Back, and 16th in the 50 Breast. Cameron Boudreau- 7th in the 50 Breast and 9th in the 100 Breast. Ian Bullerwell-7th in the 200 Breast, 13th in the 100 Breast and 50 Back, and 15th in the 50 Free. All four senior males placed 7th in the 4 X 200 Free Relay and 8th in the 4 X 100 Free Relay, 4 X 50 Medley Relay and 4 X 50 Free Relay. Senior Girls-Hannah Doucette-12th in the 100 Back, 14th in the 200 Free, 15th in the 50 Back and 100 Fly and 16th in the 50 Fly. Mary Beth Brown won our only medal -Bronze in the 100 Free. She was also 6th in the 50 Free and 200 Free, 11th in the 50 Fly, 12th in the 100 Fly and13th in the 50 Breast. The Whitecaps were 14th out of 23 Teams. 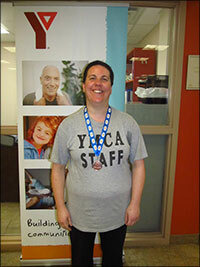 Congratulations to Maxine D’Eon, who won a Gold Medal at the Special Olympics held this past weekend in Kentville. Maxine is the “second stone”, and is wearing her medal proudly while she works. We are very proud of you Maxine! You wear it well. Yarmouth Whitecaps had a great meet in Halifax this past week end placing 6th out of 13 teams with only 12 swimmers. There were several medal performances. In the Senior Men’s category Dylan Bower won 5 events:50 Fly, 50 and 100 Free, 50 and 100 Breast and was 2nd in the 50 Back. All of his times were best times and he also qualified for East Coast. In the same category Andre d’Entremont was 2nd in the 50 Free, 100 Free, and 200 Fly and was 4th in the 50 Fly and 100 Fly. In the Senior Women’s category Brittany Paulick won a bronze medal in the 100 Fly and was 6th in the 50 Breast and 50 Fly. In the 13-14 Girls events Jadyn Hood was 4th in the 50 Breast, and 50 Back, and was 5th in the 50 Fly. Kat Kini was 4th in the 50 fly . Jadyn Hood, Kat Kini, Jenna Clayton and Hannah Maillet were 5th in the 4 X 100 Free and 5th in the 4 X 200 Free Relay with Sylvia Thibault and 5th in the 4 X 100 Medley Relay with Tasha d’Entremont. The 12 and Under Girls Relay team of Sophie Geiss, Tasha d’entremont, Chloe Durling and Brenna Veran were 5th. Hannah Maillet just moved into the 13-14 age group, and came 5th in the 800 Free. It is a very greulling event, and we are all very proud of Hannah! Yarmouth Y Whitecaps travelled to Wolfville for two meets this weekend for an Acadia Senior and Junior Championships. Yarmouth was 5th overall in the Senior Meet and 5th overall in the Junior Meet. Sr. Meet- The Senior men’s free relay placed 5th with Dylan Bower, Andre d’Enremont, Josh Bower and Ian Bullerwell. Individual Senior Men placing in the top 6 were Cameron Boudreau- 2nd in the 200 Breast and 5th in the 100 Breast. Josh Bower was 5th in the 50 Breast and qualified for East Coast Championships. Andre d’Entremont placed 5th in the 200 Fly. The Senior men’s medley relay placed 5th with Ian Bullerwell, Cameron Boudreau, Josh Bower and Dylan Bower. The Senior women’s relay placed 6th in both the free and the medley relay with Kylie Bullerwell, Mary Beth Brown, Brittany Paulick and Hannah Doucette. Individuals who placed were: Mary Beth Brown was 5th in the 50 and 100 Free, and 50 Breast. Hannah Maillet – 2nd in the 12 & under girls 400 Free and 3rd in the 200 Free making East Coast Championships in both events. Alec d’entremont – 2nd in the 400 Free, 4th in the 50 and 200 Breast and 5th in the 50 Free. 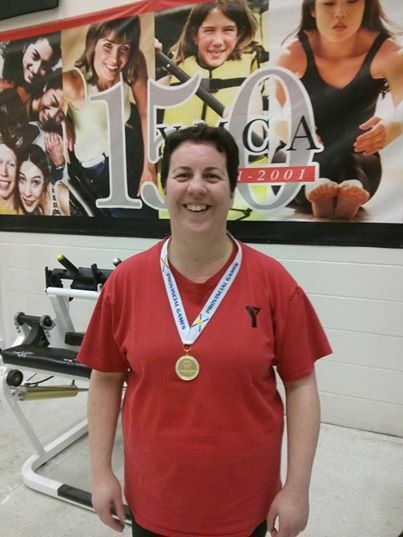 The YMCA of Yarmouth recognizes Tammy Waldron as our 2014 Volunteer of the Year. Tammy started a few years ago, and wanted to teach a cyclefit class at 6am. She convinced the YMCA to put class in our schedule from Monday through Friday, and shows up faithfully every day to teach anywhere from 6-12 early morning cyclists. Thank you Tammy for all that you do for the YMCA! 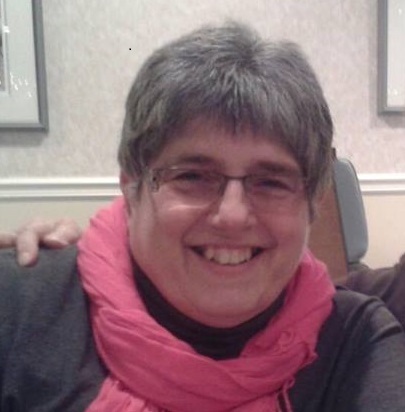 The YMCA of Yarmouth wishes to congratulate Ellen on becoming our 2013 Volunteer of the Year. Ellen volunteers in the aquatics department and teaches swim lessons to children twice a week. Thank you Ellen for all that you do! 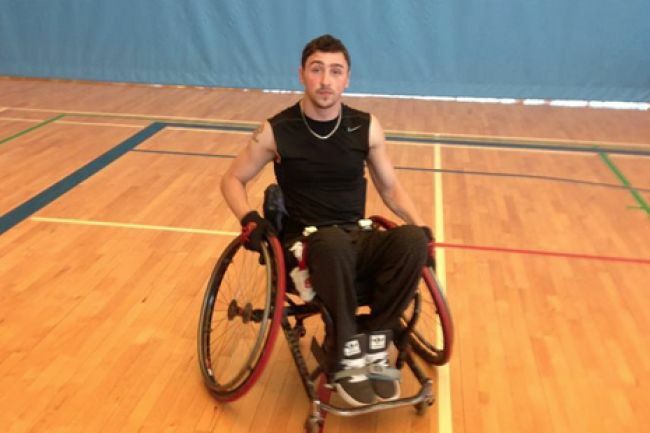 Ryan Shay has been so busy this season competing at wheelchair racing events, not to mention training for them, that he likens it to being his job. The most recent payday for Shay came when he learned he had been selected to compete at the 2014 IWAS World Junior Games, being held at the Stoke, Mandeville Stadium in the United Kingdom. The event, put on by the International Wheelchair and Amputee Sports Federation, runs Aug. 3-8. Shay left for the UK on July 31. At the games he will compete in the 100m, which he reached standards for, and also the 200m and 400m wheelchair racing events in his age category. Shay was pretty excited when he received the official notification that he had qualified for the games, not to mention when his Team Canada competition apparel arrived. It’s one thing to compete. It is another to do so while representing your country. Shay reached his 100m standards to qualify for this world event at a track competition at St. Mary’s University. “I was trying to get standards for both nationals and worlds and I pushed 20.29 which was enough to get me both,” he says. He later pushed standards again at nationals in Moncton. Shay has trained hard throughout the past year for the various events he’s competed at. Aside from training at home, he’s done training camps in Atlanta and Daytona. In May he competed at one of the largest wheelchair competitions in the world that was held in Switzerland. His ultimate goal is to qualify for the Paralympics in Rio in 2016. It’s a lofty goal, considering he only got into wheelchair racing and athletics throwing last year. Shay has been in a wheelchair since a January 2013 car crash. But he made huge strides in the months following that accident – both in rehab and turning to different types of quad sports – and the former AAA hockey player continues to look forward, not back. The best adjective to describe Shay is determined. After this competition in the UK, Shay will get a bit of a break. Aside from some races and track events closer to home, he doesn’t have any major meets coming up. Still, he says keeping busy this past year has been good for him. Actually the word he uses is “amazing.” The training and competitions are expensive so Shay has been looking for sponsors and is appreciative of any public financial support he receives. He keeps people up-to-date on his progress, training, competitions and funding opportunities on his Facebook page. Shay hasn’t had any trouble convincing himself of this. Aug. 4: So for the U23 400m races they put all the classes together and went by a point system, how close you are to the world record for your class determines your points (system is a bit flawed). Even though I crossed the line last in my heat, I came second last in the point system in my heat. However, I got a new personal best, beating my previous time by 13s with a new time of 1:22.02s!! Pretty excited even though I didn’t make finals. The 200m race is tomorrow, ready to crush that PB as well! The four Yarmouth Y Whitecaps who attended the Ken Dunn Invitational all placed in the finals of their respective events at Dalplex in Halifax this past week end. Hannah Doucette was 8th in the 13-14 Girls 200 free and 100 Back. In the same age group, Mary Beth Brown placed 3rd in the 400 Free and 50 Breast, 5th in the 50 and 100 Crawl, and 8th in the 100 Breast. In the Senior Men, Josh Bower placed 7th in the 200 IM and 7th in the B Finals of the 50 Free, and 50 Back. He was 1st in the B Final of the 100 Free and 8th in the B Final of the 100 Back. In Senior Women, Charli LeBlanc placed 2nd in the 50 Back, 3rd in the 50 Free, 4th in the 100 and 200 Back, and 1st in the B final of the 100 free and 2nd in the B Final of the 100 Fly. Charli will next represent the Yarmouth Y Whitecaps in Montreal at the Canada Cup the end of June. The Jr Provincial Swimming Championships were held at Shearwater Air Base in Dartmouth on May 24th and 25th. It was the last meet of the season for most Whitecaps. Yarmouth placed 6th overall (the meet was won by Sackville Waves). Josh Bower was the high point 15 and over male winner with a 1st in the 200IM, 200 Free,100 Free, and 50 Breast; 3rd in the 100 Breast, and 2nd in the 50 meter Free. The relay team of Josh Bower, Dylan Bower, Andre d’Entremont and Brandon Doucette placed 1st in the 4 X 50 Medley Relay and 1st in the 4 X 50 Free Relay. Dylan Bower also placed well in the Sr men’s events winning the 50 Free, 50 Fly, 3rd in the 200 Free, 4th in the 200 Back, and 5th in the 200 IM. Brandon Doucette placed 2nd in the 100 Free, 4th in the 50 Free, 5th in the 200 Free and 6th in the 50 Back. Andre d’Entremont placed 3rd in the 100 Fly, 400 Free, 200 Back and 4th in the 50 Fly and 200 IM. In Senior girls events, Kylie Bullerwell placed 2nd in the 200 Fly, and 6th in the 200 IM. In 13-14 Boys Ian Bullerwell placed 3rd in the 100 and 200 Breast, 4th in the 50 Back, and 6th in the 100 Back. Brock Emin placed 4th in the 100 Fly. Drew Doucet placed 5th in the 50 Back. Drew, Brock, Ian and Alec d’Entremont placed 5th in the 4 x 50 Free Relay. Alec d’Entremont also placed 5th in the 200 Meter Free, 200 Meter Breast and 50 Breast and 6th in the 200 IM. The 13-14 Girls 4 X 50 Free Relay placed 6th with team mates Jadyn Hood Bent, Jenna Clayton, Brittany Paulick and Kat Kini. Brittany Paulick also placed 5th in the 100 Breast. Isabell Olsen placed 4th in the 12 and under girls 50 Free. The Junior meet was Sunday with all swimmers making personal best times in the 50 meter long course events. Jadyn Bent Hood placed 2nd in the 50 Fly and 5th in the girls 13-14 50 Back, and 7th in the 100 Free. Jenna Clayton placed 5th in the 50 Fly for 13-14 Girls. Brock Emin placed 2nd in the 13-14 Boys 50 & 100 Fly, 5th in the 50 Free and 100 Free, and 7th in the 200 Free and 200 IM. Drew Doucet placed 2nd in the 13-14 Boys 50 Back, 5th in the 100 Back and 6th in the 100 Free and 50 Free. In 13-14 Girls-Mary Beth Brown placed 1st in the 100 and 50 Free, 50 Breast and 50 Fly, 3rd in the 50 Back and the 200 Free. In the same age division, Hannah Doucette placed 4th in the 50 Back, 5th in the 50 Free and 7th in the 100 Back. Andre d’Entremont placed 7th in the 15 & over boys 200 Breast. Dylan Bower placed 8th in the 15 & over boys 50 Free, 50 Fly, and 50 Back. Cameron Boudreau placed 3rd in the 15 & over boys 100 Breast and 7th in the 100 Fly. The Whitecaps joined the Mariners in Truro this week end (overlapped for the game with the Bear Cats). We had all best time performances from the Whitecaps. The team placed 8th overall with 15 teams and were the 4th small team. The meet was won by the Dartmouth Crusaders. Cameron Boudreau won a Bronze medal as the 3rd over Sr male High Point Winner. He placed 1st in the 50 & 100 Breast, 2nd in the 50 Free and 200 Breast, and 3rd in the 100 Free. He was also in the winning Senior 4 X 50 medley relay team with Andre D’Entrement, Ian Bullerwell and Drew Doucet. The 4 X 50 Free Relay team with Cam Boudreau, Brock Emin, Ian Bullerwell and Andre D’Entremont placed 2nd with a Silver medal. Andre D’ Entremont also 2nd in the Senior Men’s 100 Fly, & 200 Back,6th in the 50 Back, 7th in the 100 Breast and 8th in the 50 Free. In the Senior women’s category, Kylie Bullerwell placed, 4th in the 200 Fly, 4th in the 200 Back, and 8th in the 400 Free. In 13-14 Boys Ian Bullerwell placed 1st in the 50 Breast, 2nd in the 200 Breast 3rd in the 50 Free, 5th in the 200 Back and 6th in the 200 IM. Drew Doucet placed 6th in the 50 and 100 Back. Brock Emin placed 2nd in 100 Fly and 7th in the 50 Fly. Brock, Drew, Ian and Alec D’Entremont placed 3rd in the 13-14 Boys Free Relay and 5th in the 13-14 Boys Medley Relay. In the 11-12 Boys Alec D’Entremont placed 6th in the 200 Breast. In the 11-12 Girls Isabell Olsen placed 4th in the 50 Free. In the 13-14 Girls, Jadyn Hood Bent placed 4th in the 50 Back, 6th in the 200 Back and 100 Free, and 7th in the 100 Fly. Brittany Paulick placed 5th in the 100 Breast and 6th in the 100 Fly. The 13-14 Girls Medley relay team of Jadyn, Brittany, Tyya Goodwin and Shannon Nickerson placed 8th, and the same girls placed 6th in the 4 X 50 Free Relay. YMCA member Anna Woodworth-Gates attended the Santana Anderson East Coast Classic this winter. Anna won first place in the womens’ physique division. Judges choose a deserving recipient for the X Factor Award from every competitor, male and female, who showed the most potential to go far in the sport. She was presented with a sword for this honor. Congratulations Anna on all your hard work! Charli LeBlanc was the lone swimmer for Yarmouth in the Senior meet, placing 1st in the 100 Back, 2nd in the 50 Free, 3rd in the 200 Back, and 4th in the 100 Free. Charli placed 9th out of 13 teams. In 11-& 12 Boys Alec d’Entremont placed 5th in the 200 Breast and 7th in the 50 Breast. In the 11-12 Girls-Tyya Goodwin’s best placing was 11th in the 50 Back and Isabelle Olsen’s best placing was14th in the 50 Free. In the 13-14 Boys Brock Emin was 5th in the 200 Fly and 8th in the 50 Fly and Drew Doucet’s best placing was 9th in the 50 Back. In 13-14 Girls Mary Beth Brown placed 1st in the 50 Free, 50 Breast, 50 Fly, 200 Breast and 2nd in the 200 IM. Hannah Doucette placed 1st in the 200 Free, 2nd in the 50 Back and 50 Fly, 3rd in the 200 IM and 4th in the 200 Back. and Jenna Clayton was 13th in the 50 Back. In 15 & over Boys Dylan Bower was 1st in the 50 Free, 3rd in the 50 Breast, 4th in the 50 Back and 200 Free. Josh Bower was 1st in the 50 Breast, 2nd in the 50 Free and 200 IM, 3rd in the 200 Free and 200 Breast. Cameron Boudreau was 1st in the 200 Breast, 2nd in the 50 Breast, 5th in the 200 Free and 50 Free. Brandon Doucette was 3rd in the 50 Back, 4th in the 50 Free, and 6th in the 50 Breast and 200 Breast. The Relay team of Mary Beth Brown, Josh Bower, Hannah Doucette and Dylan Bower won the 4 by 50 Mixed Gender Free Relay. Charli LeBlanc- was 3rd in the 50 Back with a personal best time and a qualifying time for Eastern Canadian Championships, 4th in the 100 back in a time from the heats that also qualified her for Eastern Canadian Championships, 4th in the 200 Free in a personal best, 4th in the 100 free, 6h in the 200 Back and 5th in the B Final of the 50 Breast. Mary Beth Brown-was 4th in the B final of the 50 Breast, 7th in the B final of the 100 Crawl, and alternate in the 50 Fly all in Personal Best times. Cameron Boudreau- was 4th in the B final of the 200 Breast, 6th in the B final of the 100 Breast and 8th in the B Final of the 50 Breast all in Personal Best Times. The relay team of Jadyn Hood Bent, Hannah Doucette, Mary Beth Brown and Charli LeBlanc was 7th in the 4 X 100 Free Relay. There were three Sprint Eliminators each for women and men, the 50 butterfly, the 50 back and the 50 Breast. The fastest 8 advanced to the semi finals and the fastest 4 advanced to the finals. Charli Leblanc of Yarmouth advanced to two semi-finals, in the 50 butterfly and the 50 back. She advanced to the finals of the 50 fly winning 2nd place in a personal best time of 30.03 seconds, just off national time standards. Charli also placed well in several other events. She won the 100 Back, the 50 Free , was 2nd in the 100 Free and placed 3rd in the 200 free for senior women. Dylan Bower 5th in the 50 Free and Josh Bower 8th in the 50 Free for Senior men. Age Group Nationals in PQ July 23-28, 2013. Charli LeBlanc competed in the Age Group Nationals in Montreal, having set personal bests in the 50 Back, 200 Back, 200 Free and 50 Free and placed 7th in her age group for 16 – 18 year olds in the 50 back. This was an outstanding performance for Charli given that there were 200 teams and 900 swimmers in attendance. This meet marks the end of the Whitecaps 2012-2013 season except for those doing triathlons. Leland Whitman is one of the YMCA’s spin teachers, and has been a dedicated volunteer during his time with us. He continues to be an inspiration to those who attend his classes, and sometimes come in to do an extra class in case anyone comes early. Thank you Leland for making the YMCA a priority in your life. You are very much appreciated! Wanda is one of the YMCA’s spin teachers, as well as a yoga-stretch instructor. She has been involved in the YMCA for many years, and has also been on the YMCA float in the Seafest parade. She has shown that she is always willing to step in when needed, and we thank her for all that she does for us. Wanda, you’re awesome! 11-12 Girls-Tyya Goodwin 4th 50 Back, Jadyn Bent Hood 5th 50 Back, Jenna Sterling-6th 50 Back, Shannon Nickerson-8th 200 Breast. 13-14 Girls-Brittany Paulick had all best times. 13-14 Boys-Andre d’Entremont-2nd 200 IM, 3rd 50 Breast, 4th 50 Fly, 6h 100 Breast and 7th 200 Free. 13-14 Girls-Hannah Doucette-6th 400 Free, and 8th 50 Fly. Mary Beth Brown-1st 100 Free, 4th 50 Breast, 6th in 100 Breast and 200 Breast,. 15 and Over Males-CJ Killam-Personal bests in the 50 Free and 50 Fly. On Sunday, February 24th, 2013, YMCA member Renee Grant-Leblanc competed in the Disney Princess Half Marathon, held at Walt Disney World resort in Florida. The Disney 13.1 mile course travels through The Magic Kingdom, and Epcot Theme Parks, and is a womens’ only focused marathon. Maxine d’Eon, one of our long-time staff, shows off her Bronze medal. Maxine competed in Special Olympics Nova Scotia in February 2013, and her team won bronze in Curling. Nine Yarmouth Whitecaps qualified and attended the East Coast Short Course Championships this past week at Dalplex in Halifax. There were 33 teams with over 400 swimmers from teams across Atlantic Canada. Yarmouth placed 16th. Charli LeBlanc placed 5th in the 50 Back, 5th in the 100 Free, 6th in the 200 Back and 2nd in the B Final of the 50 Free and 200 Free. Zoee LeBlanc placed 2nd in the 200 Breast, 6th in the 50 Breast and 200 IM and 2nd in the B Final of the 100 Breast. Jessie LeBlanc placed 6th in the 100 Free, and was 1st in the B Finals of the 50 Free, 100 Back and 200 Free and was 3rd in the B Final of the 200 Back. In the 13-14 Girls individual events, Mary Beth Brown placed 7th in the 50 Breast. CJ Killam won the Para swimmers 50 Breast stroke. This brings to an end the short course season for these swimmers. Eastern Canadian Nationals in Montreal. Charli LeBlanc of the Yarmouth Y Whitecaps set two personal best times, (just missing the B final for the 200 Back). Her 200 back time, put her in 25th place. Her 50 back time put her in 30th place and her 100 back time put her in 43rd place. Charli’s 200 Back time was also a second qualifying time for her for the Canadian Age Group Championships to be held this summer in Montreal. Charli will be joining her sisters Zoee and Jess and six other Whitecaps: Max Poole, CJ Killam, Josh and Dylan Bower, Hannah Doucette, and Mary Beth Brown in Halifax in two weeks time for the East Coast Championships. In the 11-12 category Jenna Sterling had personal bests in 4 of her events. Jadyn Hood won Bronze in the 50 fly and was alternate in the 50 breast and 50 fly. In the Senior boy’s category Carlos Friere won Gold in the 200IM, won silver in the 50, 100, 200 and 400 free and won bronze in the 100 Breast.